How does a company follow up on something as wildly popular as the revolutionary Jellyfish 2-in-1 beam effect? Easy – by offering a second helping of jelly, with a new 2-in-1 effect, that’s just as transparent, just as versatile and just as likely to stop people in their tracks, get them to turn their heads, point up at the transparent case and say “WOW! 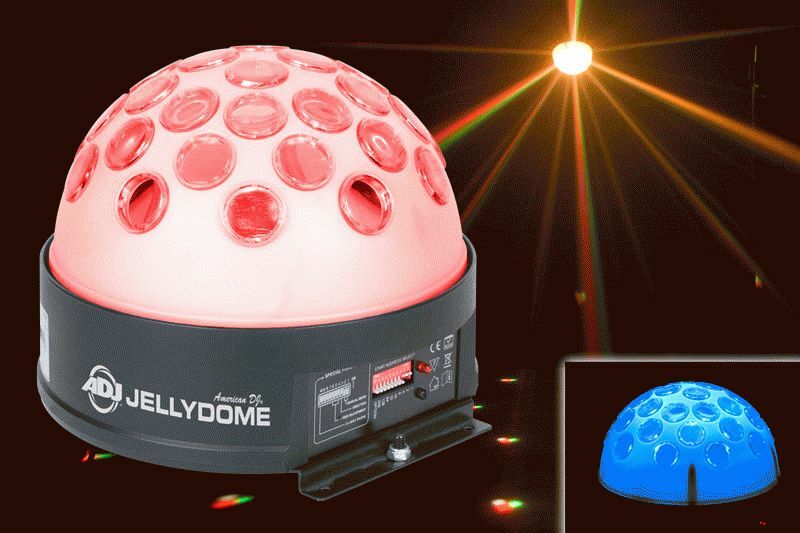 The new Jellydome from American DJ is an intelligent RGBW LED moonflower that produces seven brilliant colors and – like the Jellyfish effect before it – boasts a glowing see-through case. The transparent case makes the Jellydome two exciting effects in one: a brilliant LED moonflower and a glow dome. The Jellydome packs a powerful one-two punch: its 34 sharp RGBW beams of light make it a great moonflower, and its transparent case creates a unique glow effect. Even in the off position, the Jellydome resembles a magnificent bejeweled dome that is sure to catch attention. When active, the 10W 4-in-1 RGBW LED is capable of producing 7 dazzling colors: red, blue, green, purple, yellow, cyan and white, so any mood can be achieved through the vast array of hues. Boasting a 138° beam angle of brilliance and an array of exciting built-in programs, this dance floor diva can produce stunning effects with or without the use of fog. Its 0-100% electronic dimming can create any desired ambiance with ease. The Jellydome’s 3 operational modes DMX-512, Master/Slave or Sound Active – allow for versatility of operation. When in DMX mode, the unit operates on3 DMX channels. This stylish light effect features multi-voltage operation (AC 100-240V, 50/60 Hz), so it’s ready to produce a glittering mirror ball effect for party people wherever they may be. This brilliant dome can run all night as long as the party is pumpin’; and thanks to the cool operating temperature of the Jellydome’s LEDs, the dance floor will remain hot only in the figurative sense. Plus, can be packed up as soon as the party is over, since it’s not necessary to wait for the device to cool down to pack it away. The Jellydome’s handy linking capability via its 3-pin XLR cable means DJs can pack a cache of these jewels in their treasure chest effortlessly. What’s more, because of the Jellydome’s lightweight and petite stature, (8.25”L x 8.25” W x 7” H and 5 lbs. ), mobility and traveling with multiple units is a breeze. Mobile entertainers will marvel at the overall ease and portability of the newest member of the Jelly family and appreciate the convenience of its extremely long LED life, so they can shine on for years to come. Click here to see the Jellydome in action!